Can Image Captioning Help Passage Retrieval in Multimodal Question Answering? 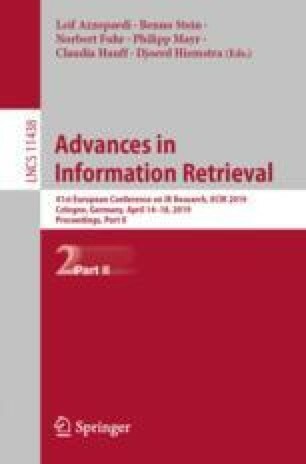 Passage retrieval for multimodal question answering, spanning natural language processing and computer vision, is a challenging task, particularly when the documentation to search from contains poor punctuation or obsolete word forms and with little labeled training data. Here, we introduce a novel approach to conducting passage retrieval for multimodal question answering of ancient artworks where the query image caption of the multimodal query is provided as additional evidence to state-of-the-art retrieval models in the cultural heritage domain trained on a small dataset. The query image caption is generated with an advanced image captioning model trained on an external dataset. Consequently, the retrieval model obtains transferred knowledge from the external dataset. Extensive experiments prove the efficiency of this approach on a benchmark dataset compared to state-of-the-art approaches. The online version of this chapter ( https://doi.org/10.1007/978-3-030-15719-7_12) contains supplementary material, which is available to authorized users. This work is funded by the KU Leuven BOF/IF/RUN/2015. We additionally thank our anonymous reviewers for the helpful comments.